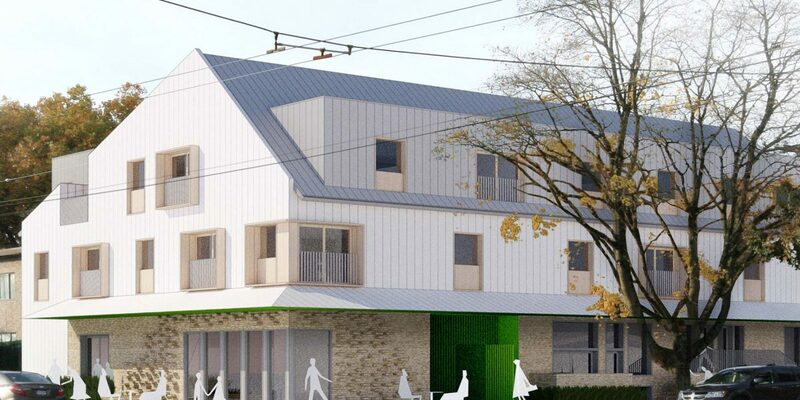 Tomo House is a proposed cohousing project for middle-income families. Tomo stands for “together + more,” a name that reflects the project’s guiding ideals. As housing prices rise faster than income, many families cannot afford traditional single-family homes. They are looking for more housing choices somewhere between single-family homes and high-rise condos. We believe that affordability, sociability, and sustainability goals are interconnected and work together in a virtuous cycle. For all the homes in this project, we seek to lower housing costs through multiple levers. For example, we propose a low-rise wood-frame building with pre-fabricated panels that have lower construction cost than a high-rise concrete building. We also look for opportunities where subtracting something has added benefits. For instance, we choose to create a shared laundry area that facilitates social interactions in the Common House for less cost than buying and operating 12 sets of in-suite washers and dryers. Cohousing describes an intentional community centered around social connectedness in which residents actively participate in the design and operation of their housing. Despite its many affordable advantages, the typical cohousing process has many barriers, including escalating land bids, long development timeline, and considerable expertise and time commitment required. Cohousers report that 70 to 80% of groups that start projects are unable to overcome these barriers and complete them. For groups that do complete their projects, the process is long, taking an average five to seven years from group formation to occupancy. Tomo and Our Urban Village (“OUV”), a Vancouver-based cohousing group, are working together to pioneer a more streamlined approach called “Cohousing Lite.” Our goal is to make cohousing development easier for members, deliver homes faster, and with less risk. Under this collaborative approach, Tomo is responsible for land acquisition, project design, and construction management. OUV members give feedback at strategic points in a codevelopment process and make decisions on a limited set of critical issues. Happy City has gathered evidence on the relationship between design and social connections in multi-family, multi-generational housing. Building on this body of work, Tomo applies the following design guidelines for social wellbeing. Clusters of housing featuring 8 to 15 units in walkable, transit-served neighbourhoods are ideal to nurture supportive social connections. However, group sizes can’t be so small that there are not enough households to share responsibilities. When people self-organize to work on causes that are bigger than themselves, they feel happier and more connected to each other. Delineating a gradient of neighbourhoood, communal, family, and personal spaces gives people a sense of control, invites participation, and creates feeling of safety. Positive relationships need purposeful social contact; but informal, unscheduled encounters with neighbours nurture trust and belonging, and often lead to deeper interactions. People’s ability to experience nature with all their senses is strongly linked to positive household and neighbourhood relationships and social trust. Residents who are able to live in the same place longer, either as owners or renters, build stronger bonds of trust and social connection, which in turn increase community wellbeing. Passive House (PH) is one of the leading global standards for energy efficient buildings. The appeal of this approach is its simplicity: a super-insulated structure with careful use of high performance windows. It reduces the building’s energy consumption to virtually zero (15 kWh/m2 per year) and minimizes long-term maintenance costs by eliminating complex active mechanical systems. Tomo House is designed with PH fundamentals from the start. The building’s simple L-shape reduces surface area, and in turn, heat loss. It is also oriented to optimize for solar gains through south-facing windows. To make some meaningful impact on housing affordability, we believe the solutions need to be scalable ­– they need to be sensible for more sites, be buildable by more types of groups, and be sharable so that the solutions may improve quickly over time. We incorporated this scalability in Tomo House’s design from the beginning. We started with a fairly standard Vancouver double lot. Double lots are more readily available than larger development sites that require complex land assembly. The design, as smaller-scale projects with the use of prefabricated Passive House panels, may be developed by more small-scale developers and grass-root groups like existing homeowners and cohousing members. Its ground-oriented form, 3.5-stories high, is more compatible with finer-grained single-family neighbourhoods, and has the potential for greater adoption across the city. We are committed to sharing lessons learned and best practices to help facilitate more collective housing in our city. Furthermore, Tomo collaborator Happy City will, using its evidence-based approach, conduct longitudinal post-occupancy studies of social connectedness and wellbeing. Their findings will be shared publicly and contribute to the emerging body of research on designing for sociability in multi-family buildings. Process: How might we make homes more affordable and happier?